Update 24. 8.: Endgültige Version der IAU Resolution ist jetzt online! Hier der Text der heute vor der Diskussion und Information ausgeteilt wurde. Contemporary observations are changing our understanding of planetary systems, and it is important that our nomenclature for objects reflects our current understanding. This applies, in particular to the designation 'planets'. The word 'planet' originally described 'wanderers' that were known only as moving lights in the sky. Recent discoveries lead us to create a new definition, which we can make using currently available scientific information. (Here we are not concerned with the upper boundary between 'planet' and 'star', nor the distinction between stars and brown dwarfs). (1) A planet is a celestial body that (a) has sufficient mass for its self- gravity to overcome rigid body forces so that is assumes a hydrostatic equilibrium (nearly round) shape, and (b) is in orbit around a star, and is neither a star or a satellite of a planet. 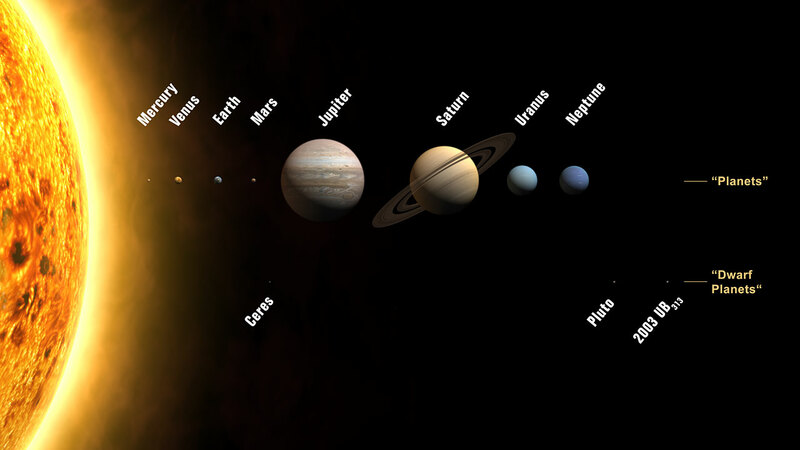 (2) In our Solar System we distinguish between the eight "classical planets", as the dominant objects in their local population zones, and "dwarf planets", which are not. (3) All natural non-planet objects orbiting the Sun, currently includind most of the Solar System asteroids, near-Earth objects (NEOs), Mars-, Jupiter-, Neptune-Trojan asteroids, most Centaurs, most Trans-Neptunian Objects (TNOs), and comets, shall be referred to collectively as "Small Solar System Bodies". In the new nomenclature the term "minor planet" is not used. This generally applies to objects with mass above 5 x 10^20 kg and diameter greater than 800 km. An IAU process will be established to evaluate planet candidates near this boundary. Pluto is a dwarf planet by the above scientific definition, as are one or more recently discovered large trans-Neptunian objects. In contrast to the classical planets, these objects have orbital periods in excess of 200 years and typically have highlx inclined orbits with large eccentricities. We designate this category of planetary objects, of which Pluto is the prototype, as a new class that we call 'XXXXX'. We propose that the MPC create an new and separate catalog for these objects and their orbital characteristics, with Pluto as the first entry. For two or more objects comprising a multiple object system, the primary object is designated a planet if it independently satiesfies the definition of a planet. As secondary object satiesfying these conditions is also designated a planet if over most of the orbital period the system's center of gravity resided outside the primary. Secondary objects not satiesfying these criteria are satellites.